A series of industry-specific fairs will provide students an opportunity to make connections with employers in a smaller venue. Binghamton University students will be able to talk to industry-specific representatives during revamped job fairs this spring. Image Credit: Jonathan Cohen. Binghamton University students will be able to talk to industry-specific representatives during revamped job fairs this spring. Photography: Jonathan Cohen. 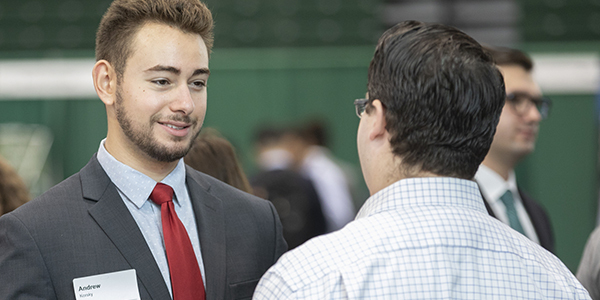 Thousands of Binghamton University students take advantage of the networking opportunities provided at the Job and Internship Fairs hosted by the Fleishman Career Center every fall and spring. This spring, however, things will look a little different. Through a series of smaller, industry-specific fairs, students will have an opportunity to make connections with employers in a smaller venue. “Because of the nature of recruiting, large, fall-semester fairs make a lot of sense,” said Paul Deamer, senior assistant director of employer and alumni outreach at the Fleishman Center. STEM Fair: 11 a.m.-3:30 p.m. Thursday, Feb. 21, in the UU-Mandela Room. RSVP in hireBING. Business and Communications Fair: 11 a.m.-3:30 p.m. Thursday, Feb. 28, in the UU-Mandela Room. RSVP in hireBING. Student Employment and Summer Opportunities Fair: 11 a.m.-2 p.m. Thursday, March 7, in the UU-Mandela Room. RSVP in hireBING. Common Good, Government, Non-Profit and Summer Camps Fair: 11 a.m.-3:30 p.m. Thursday, March 28, in the UU-Mandela Room. RSVP in hireBING. The new fairs include a Common Good, Government, Non-Profit and Summer Camps Fair; a Business and Communications Fair; and a STEM (Science, Technology, Engineering and Mathematics) Fair. In addition, the Fleishman Center will host the University’s first Student Employment and Summer Opportunities Fair for students looking for part-time jobs on and off campus for the summer and upcoming academic year. To best prepare for the industry-specific fairs, Denise Lorenzetti, director of the Fleishman Center, recommends planning ahead. Students can visit the Fleishman Center before the fairs to make sure they are fully prepared to take advantage of them, whether to look for a job or an internship, or just gain career advice from professionals in the know. One of the goals of the new format is to provide students with easier access to opportunities directly related to their career interests. The fairs will all take place in the Mandela Room, maximizing accessibility, and Deamer expects between 40 and 50 employers to attend each one. All students are welcome to attend any of the fairs that interest them, regardless of their major. These new fairs, along with a nursing fair held in the fall and a pharmacy career day slated for the spring, are part of Fleishman’s University-wide effort to provide specific career and networking opportunities for students in as many fields of study as possible.